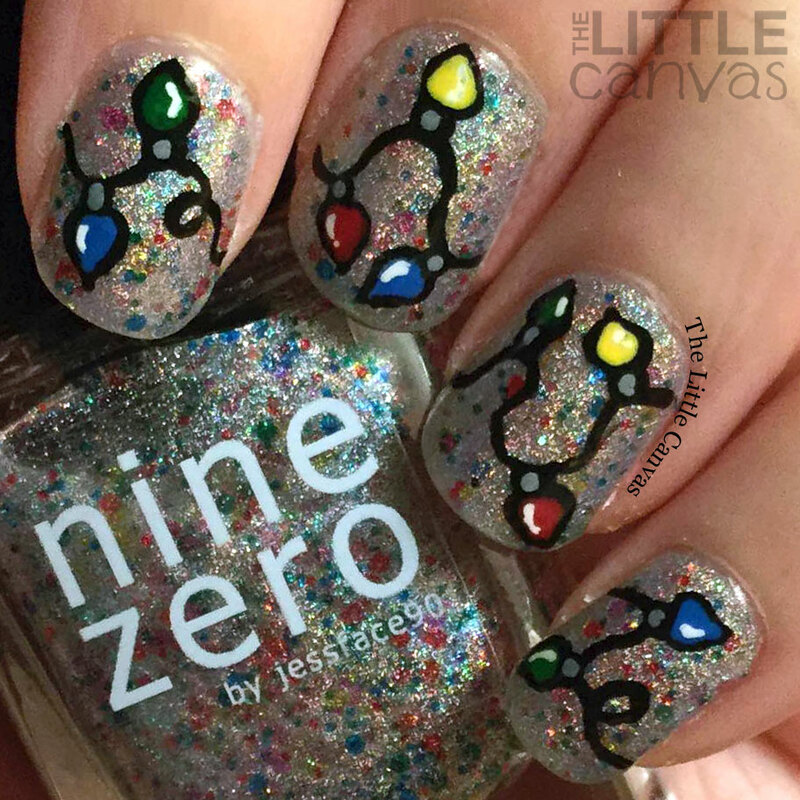 Twinkle Light Nail Art with Nine Zero Lacquer Twinkle Lights! Good morning polished world! How are you all doing on this fine Monday? It's supposed to be 65 degrees here today which is VERY abnormal. Despite the fact that it's warm, there still is this winter chill in the air. Which is kind of making me believe that we might get a white Christmas after all. Who knows though. 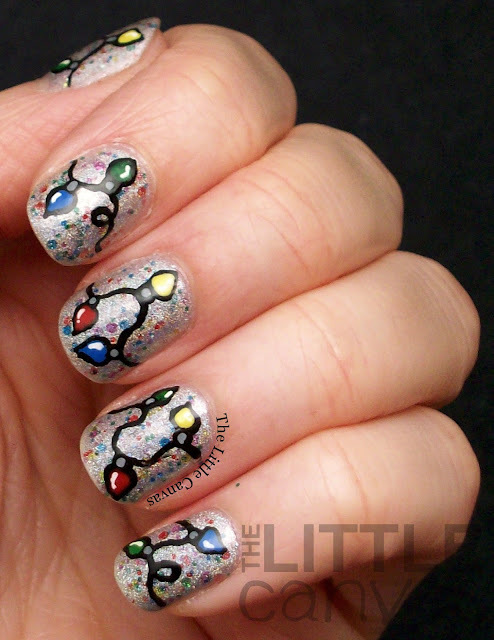 Today I am sharing with you my annual Christmas light manicure. I purchased a few of the Nine Zero Lacquer holiday polishes, one being Twinkle Lights. 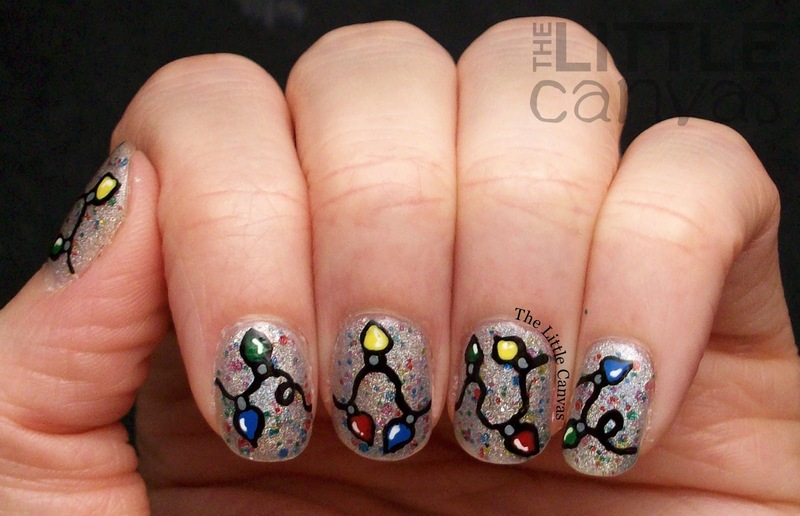 It only made sense to create a twinkle light manicure over a polish called Twinkle Lights! I cannot get over how gorgeous this polish is!!! Twinkle Lights is a silver linear holo with semi transparent rainbow glitters throughout. That's right, semi-transparent rainbow glitters....in a linear holo. It is just as awesome as it sounds. I never knew that semi-transparent glitter was a thing, but using them in this silver holo was genius. The polish applied perfectly in two coats. After the first coat, I was really unsure that I would get full coverage because it was very sheer. Then second coat, the silver built up, the glitters evenly covered, and it was perfection. 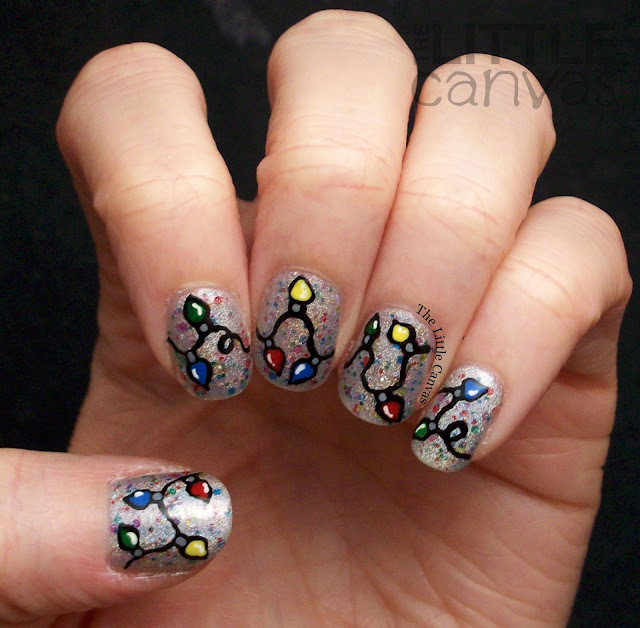 To create the lights, I used a nail art brush and drew the "wire" onto my nails with a black acrylic polish. I then went through with a toothpick and outlined all the light bulbs. Once the outlines were dry, I used a small dotting tool and filled in all the empty spaces like a coloring book. Again, with a toothpick, I drew on the white line. Last year, I then went through and added glitter over the top of the lights which really made them sparkle. 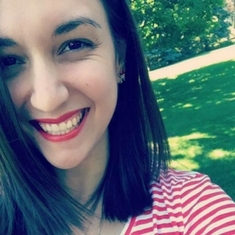 I debated on doing that this year, but decided against it because I thought it would take away from the gorgeous base. Now after seeing the photos, I'm really happy I kept the lights a plain cream. I think it added dimension, and look like they're almost popping off the base. What do you think? Do you like the lights? Are you a fan of Nine Zero Lacquer? I cannot wait to show you my next manicure using Santa Suit by Nine Zero Lacquer. It's just as gorgeous as this polish!